This book shows how globalisation and international trade create environmental injustices between different parts of the world. Richer nations are able to shift their environmental loads onto poorer areas of the world-system, where labour and natural resources are cheaper and environmental legislation less of an obstacle. 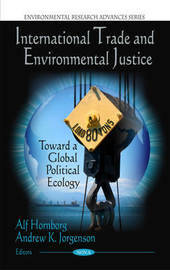 The chapters discuss recent approaches to ecological unequal exchange and environmental load displacement that use biophysical metrics rather than money to measure the uneven flows and the environmental impacts of international trade. The approaches discussed include social metabolism and material flow analysis; energy analysis; world-system and social network analysis; ecological footprint analysis; life cycle analysis; and the use of a "green" index of human development. Alf Hornborg is a professor of human ecology at Lund University in Sweden.